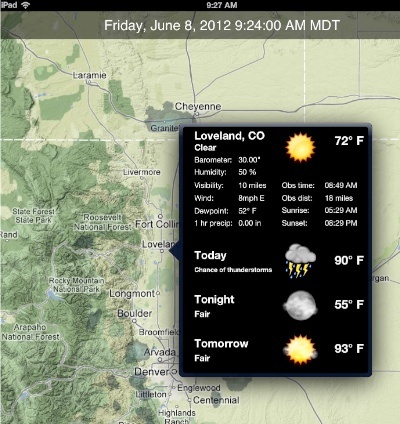 The NOAA Radar US app for iOS shows the local terrain and weather radar images. Colored quadrilaterals outline regions of watches and warnings. The app is a must in stormy weather. Recently, in the Denver region, we’ve had some very bad weather — tornados and hail storms. I found myself wanting more specific information about watches and warnings, especially the NOAA boundaries when our satellite TV was inoperable during the storm. This app had exactly what I wanted. 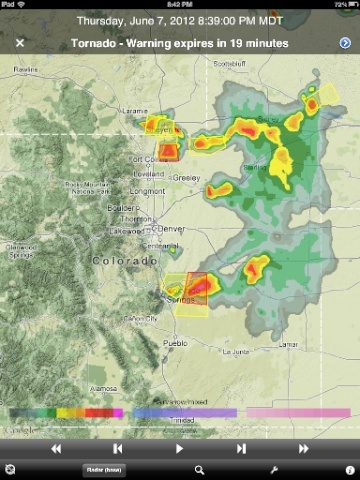 Here’s a screen shot from Thursday, June 7, when we had multiple tornado warnings northeast and southeast of Denver. Main page showing polygons, overlay of watch/warning, motion controls and legend. If you touch one of the colored quadrilaterals (or polygons), an overview of the watch or warning comes up at the top of the screen in a translucent grey bar. If you want the official NOAA text, click the blue arrow. Right off the top, the app gives you what you need with a nice iOS interface: drag to center or pinch to zoom. The app has a lot of other cool features, listed on its App Store page, so I won’t list them all. Notable is the ability to just press and hold on a geographical region, and a forecast popover appears. Also notable: you can define the technical details of the radar mode, control the clutter, select the kind of map you want (satellite, roads, terrain, or hybrid) and adjust the transparency of the clouds. You can animate the recent radar weather activity, but there is also automatic refresh when new data is available. Of course, it uses your location and displays a pushpin where you are, so you can watch the development of the storm around you. At times, I found the display slow to update and fill in all the map sectors. Also, even though I have a fast cable modem connection, occasionally, the app would complain about a lost Internet connection. I didn’t do any network testing, other than to verify 22 Mbps speed, and most of my use was in bad weather. So I’ll chalk it up to the typical network and server loads that happen from time to time, especially during bad weather. Ninety-five percent of the time, I didn’t have a problem. Definitely. When there’s bad weather and you perhaps don’t have access to TV reports, it’s great to be able to use an iPad (assuming you still have Wi-Fi or 3G/4G) to check on the watches, warnings, and NOAA alert details. This is a must have for your iPad or iPhone library of apps. 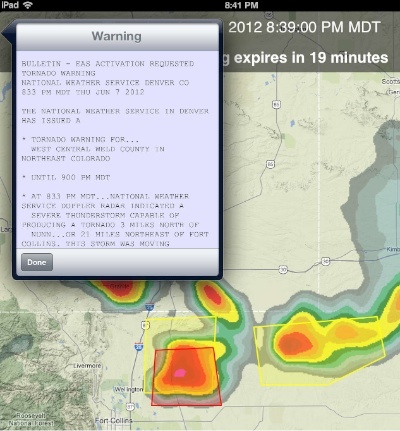 Great graphica display of NOAA Weather radar, text alerts, goo integration with iOS, lots of display options. Sometimes slow to update map sectors.